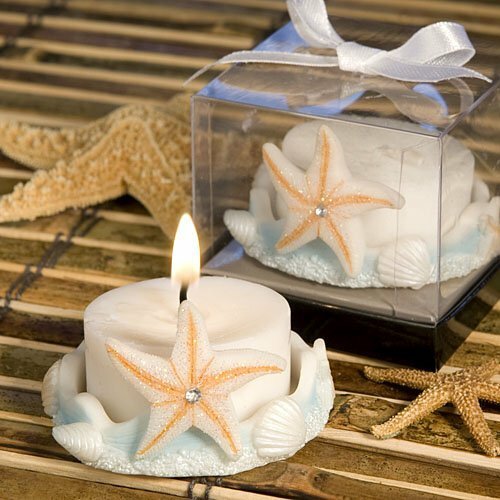 Shine a light on your beach-themed event with our iridescent finish starfish candles. Each 1 1/4" x 2" favor has an included tea light nestled in a poly resin blue and natural base encircled with shells and finished with a rhinestone adorned starfish. Each candle comes packaged in a black bottomed gift box with a clear top and finished with a white satin bow. I received a sample of tea lights with the starfish design candle favors, can these be personalized? Unfortunately, the Blue Base Starfish Design Candle Favor can't be personalized. It is packaged in a black bottomed gift box with a clear top and finished with a white satin bow as shown on the photo. What is the diameter of the candle? Can you provide me me proper measurements of the candle and the clear box that its in? The Blue Base Starfish Design Candle Favor measures 1 1/4" x 2" and the box is just slightly larger; approximately 2" x 3". If you'd like, you can also buy 1 sample at our discounted favor and shipping cost on our site to ensure it will work for your needs before placing a larger order.